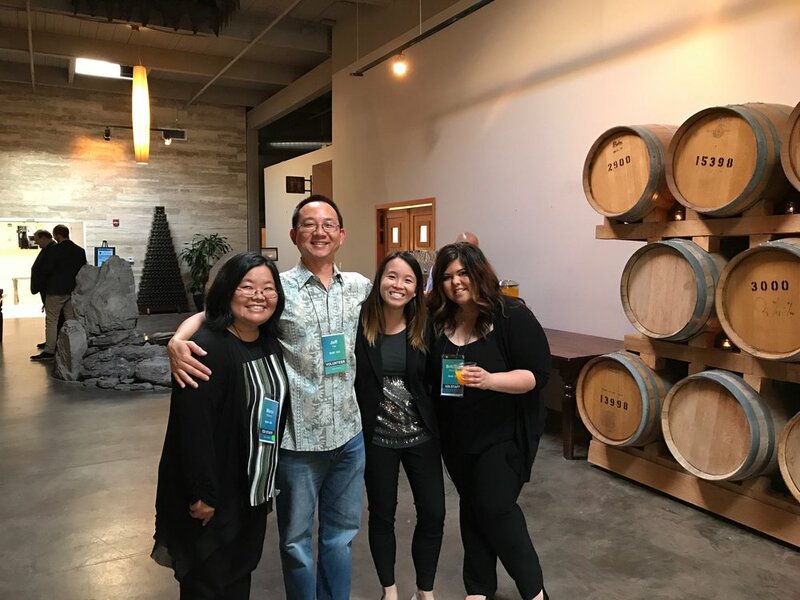 EDI alum, Jeff Tan, poses with the staff at 2017 Inclusion Fusion. Three years. I can’t believe time has flown by so quickly. It feels like yesterday when I walked into the EDI Office for my interview with Al and Marci. In these past three years, I think I’ve been really lucky. I had not one, but two great bosses who have mentored and supported me. I have met and worked with many amazing people, including staff, Program Chairs, alums, board members, facilitators, and more. Though I’ve never “officially” graduated from EDI’s programs, I’ve been lucky to have the opportunity to attend the class sessions, learning alongside and from participants. I've known how it feels. I’ve struggled with speaking up at meetings. I didn't necessarily enjoy networking or working on team projects. I lacked confidence and second-guessed myself all the time. Though it was an accumulation of many factors, I came to EDI, asking myself, “What am I doing here?” Out of my comfort zone. Terrified of the unknown and averse to change. Pha Mom, Marci Nakano, Al Sugiyama, Chan Lo, Colleen Yamaguchi, and Vanna Novak celebrated Vivian's college graduation. Vivian graduated from University of Washington, Class of 2016, majoring in Creative Writing & Communication. Here I was, a junior in college who spent her time creating monthly newsletters for her friends, landing her first job and real work experience. I thought it was unbelievable that I would be paid to create newsletters among other things that I did as a hobby. But looking back, it wasn’t such a far-fetched idea. It didn’t come as a surprise for me or anyone who knows me that I decided to work for a non-profit organization. Throughout high school and college, I volunteered with many non-profits. I was the lead volunteer for the summer youth program at the Chinese Information Service Center (CISC) for many years. Similar to EDI Program Chairs, I wanted to give back to the program that supported and nurtured me. I also helped coach soccer at my elementary school with Seattle Scores and worked as an office admin at International Community Health Services (ICHS). I was even a participating member of an academic club, which focused on community service. People always ask me, “Why?” Why non-profit? Why volunteer? The answer is, “Why not?” Of my school friends, I might be the only one active in the community. But for me, there has always been a connection. With CISC, I saw myself in the children who participated in the program. I still remember the volunteers during my time, who made me feel valued and helped me. If I'm capable and can do it, why not? Why not donate my time as a volunteer? Why not work for a non-profit? I always feel happy knowing, I'm helping someone in need. With EDI, I strongly believe in our mission and know as an organization, we are helping to develop the next generation of multi-cultural leaders like myself. Three years. It hasn’t been that long. During my time with EDI, I've spent it telling our story and now that I’ve been asked to share my own thoughts, it’s highly uncomfortable. It’s probably cultural and most likely because I don’t enjoy talking about myself, but that’s what EDI is all about – getting out of your comfort zone. All the things I don't like and feel uncomfortable doing, is more reason for me to do it. Now, I speak up at meetings, sharing my ideas and taking ownership of projects. For the past two years, I've been serving as a committee member for the Asian Pacific Islander Heritage Month Celebration. After attending many community and social events, I always recognize a face and feel comfortable approaching people. Change is scary, yet inevitable and necessary. I've enjoyed my comfort zone at EDI, but I believe it's time for new challenges and experiences. It's time for this sprout to grow further. So as I leave EDI, I'm packing up my toolbox. I'm ready to rotate my iceberg and seek new opportunities. I don't know what my next steps are, but I know EDI has paved the way. I'll always be grateful. Thank you, EDI. This is goodbye, but it won't be the last you'll see of me. I guarantee. EDI is family and I know I'll always be welcomed. Above: Over 100 people attended Marci's Meet & Greet in Seattle last month. CELEBRATE!! That’s the word that comes to mind when thinking about all that has happened in the last few months. We CELEBRATE the successes of all our alumni who are out there influencing and making a positive impact in their companies and in the community. The “Alumni on the Move” section of our newsletters showcase promotions, career successes, awards and also highlight how alumni stay connected and engage in the community. We have lots of photos to share this month and we hope to highlight much more throughout the year. Thank you to our alums who have shared photos and stories with us. Please keep them coming, we love to hear from you! We had the opportunity to CELEBRATE leadership & diversity at the Portland General Electric Diversity Summit on April 7th. Thanks to Navigation alum, Lorena Juarez, for inviting EDI to participate. There were close to a 1000 attendees and it was great to connect with leaders in the Portland community and reunite with some of our Portland alumni. Special thanks to 2010 alum, Natasha Siores, for helping staff our EDI booth. On May 3rd we CELEBRATED Asian Pacific Islander Heritage Month with the annual event led by the Asian Pacific Director’s Coalition at Seattle Center. Special thanks to EDI Marketing & Communications Coordinator, Vivian Huang, and Class of 2013 alum, May de los Reyes for staffing the EDI booth. The spotlight was on Class of 2014 alums Joe Darza and Winny Chao who MC’d the event and Kyle Theptee who MC’d the Hum Bow eating competition. Michael Liam and May de los Reyes were the judges. It was great to see alums in the crowd and was a fun way to kick-off API Heritage month. May 5th was The Seattle Foundation’s GiveBIG day. In the office this week we CELEBRATED our GiveBIG success with cupcakes! Thanks to your support we were able to raise over $4,700 which is the most we’ve raised since we started participating in this event. Lastly, thanks to everyone who attended the meet & greet event on April 20th at Four Seas. We had about 100 attendees and it was great to see so many Executive Directors, community leaders, EDI Board members, alumni and future participants coming together to CELEBRATE EDI. I’m looking forward to the Portland meet & greet on May 18th!